In a food processor, chop the onion, beets and cabbage until fine. Add the Corned Beef and pulse until coarsley chopped. Place the contents of the food processor into a large mixing bowl. Then pulse the remaining vegetables individually until coarsely chopped and add to the mixing bowl. Mix the chopped corned beef and vegetables and add salt if needed. Separate the hash into four portions. Heat 1 Tbsp. butter in a large skillet over medium heat. Add the hash to the skillet and flatten with a spatula to approximately 1-inch thick and cook until browned, approximately 4 minutes. Flip hash and cook until second side is browned. Remove from skillet and keep warm. While the patties are cooking, poach four eggs. 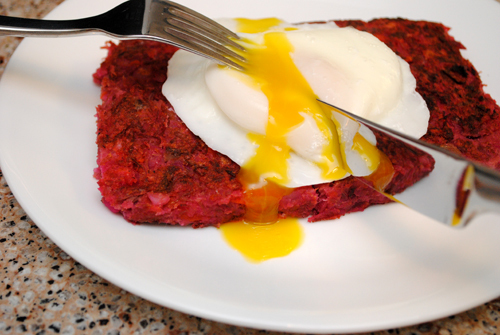 Transfer poached eggs to the top of each hash pattie and serve warm.